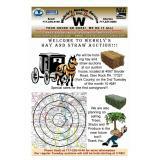 HAY, STRAW , AND FIRE WOOD AUCTION IS POSTPONED TILL TUESDAY FEB. 19, AT 10 AM!! DUE TO FORE CASTED WEATHER!!! HAY, STRAW, AND FIRE WOOD AUCTION!! WE HOLD THESE AUCTIONS ON THE SECOND TUESDAY OF MOST MONTHS AT 10 AM !! BUYERS AND SELLERS BOTH NEEDED!!! !